The residential property market continues to mimic the cycles in the overall economy. According to the Central Bank (March 2018), the price of a standard three-bedroom unit rebounded from a low of just over TT$1.0Mn to a high of just over TT$1.4Mn. The median house price during the past year was TT$1.3Mn. 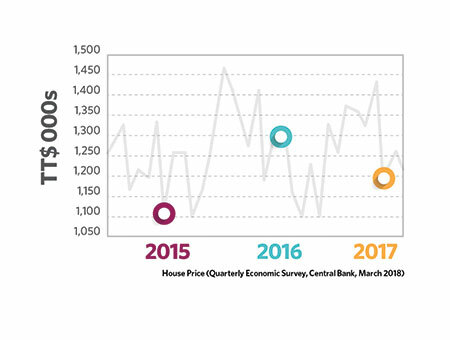 As the economy continues to rebound in 2018, the expectation is that the median house price will increase slowly as the market adjusts incrementally. The commercial rental market continues to enjoy buyer’s market status with tenants either reducing their footprint or holding their landlords to zero rental increases. Vacancy rates increased during 2017, as companies rationalized their space utilization and opted not to exercise their option for lease renewals. The outlook for this segment is that the existing market conditions will hold in the short term until confidence is restored to the economy. According to the Central Bank data, property development contributed 5.33% – 6.37% of GDP at cost during the past six years and represents on average TT$9.4 billion in output annually. Although property development activity declined by 0.32% in 2017 compared with 2016, the outlook for this sector remains optimistic as the economy continues on the path to recovery. A new shopping centre in the Trincity area. This sector is dominated primarily by in-house provision, particularly in the commercial (retail and office) and industrial segments. Skilful lease and rental negotiations will be critical success factors for operators in this sector. The impact of the expected economic turnaround will not be realised in the short term given the longer duration of lease contractual arrangements. A significant development that will impact the property management sector is the change in the lease reporting requirements for public entities with the coming into effect of the International Financial Reporting Standards 16 (IFRS 16) from 1 January 2019. The IFRS 16 standard requires lessees to recognize assets and liabilities for all leases unless the duration is 12 months or less or the subject asset has a low value. As a rule of thumb in mature markets, total facilities management (FM) services (i.e. outsourced and in-house provision) contributes approximately 4.9% of GDP. A conservative estimate of the size of the FM industry in Trinidad and Tobago, given the current stage of the emerging market here, would be in the order of 2.5% of GDP. At current GDP levels, this would translate to approximately TT$3.7 billion annually. At this level of output, the prospects remain good for the industry as the economy improves, particularly for integrated FM providers. Taken as a whole, the Real Estate, Property Development, Property Management, and Facilities Management sectors remain an attractive space for investors, particularly with the expected turnaround in the economy.